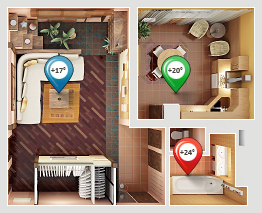 What is the difference between three heating systems? In water heating systems heat-transfer liquid is warmed up by heating boiler, and then it gives up the warmth through the pipelines net or through radiators. Heating by electricity is a heating of the rooms without intermediate heat carrier use but by conversion of electric energy to thermal. In air systems heat carrier is heated air which is supplied to heated room. Independent heating systems allow to be independent from central heating and to individually maintain comfort temperature in each room. They are specialized on providing served object with warmth and hot water. 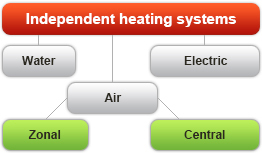 Modern systems of independent heating by air can include: heating, conditioning, ventilating, cleaning, moisturizing, aromatizing and sterilizing of the air. They are more mobile, environment friendly, chipper, more efficient, reliable and they don’t have disadvantages of centralized heating. Advantages of air heating on base of gas convectors. Benchmarking study of air and water heating.